Notice: Any and all names of pets and/or users included in this article are there only after specifically asking permission to include them. My attention was distracted from my current experiments involving the aerobic respiration rate of germinating Black Eyed Peas by the sudden, unnecessarily abrupt entrance of my 'owner'. She immediately proceeded to rush up to me, babbling incessantly about Fyora-only-knows-what. After approximately two minutes of my staring at her with an appropriately blank expression, she took a deep breath and slowed her talking to a speed audible for someone other than a Miamouse. From there I was able to determine that she was ranting furiously to me about the concept of trading pets. Now, although I do prefer to spend most of my time hidden away in the dark, comfortable recesses of my laboratory, it doesn't mean that I don't keep an eye on the rest of Neopia. I was familiar with this concept and the heated arguments that have arisen because of it. Many struggle with the potential moral issue of treating pets as items, while others like to believe that we are no more than pixels. Complete fools if you ask me; of course we're real. The true question, one I have pondered for quite some time, is whether these supposed 'owners' are really 'humans' as they claim to be or if they're simply crazed robots. Based on my experiments involving my own 'human', the latter seems to be a more likely explanation. But either way, I knew that in order to calm my human, it would be necessary for me to figure whatever it was that had bothered her for myself. Dealing with her crazed emotions is rather like attempting to coax a Kadoatie down from a tree - impossible unless you have sardines. So, after supplying her with the necessary tin, I headed off to the so-called "Neopian Pound Board". Upon entering, I was hit by a sudden wave of acronymitis so strong that I could barely breathe. After the crippling moment had passed, I set about figuring out what all of the letters actually meant. 'Well-named'? 'Badly-named'? What was this nonsense? 1. As I had heard, many of these humans who were trading pets, were trading them according to the 'worth' of their color, a hierarchy laid out in accordance to how much it had cost to paint the pet. 2. The name of the neopet seemed to have a huge impact on the worth. Many people with pets who were painted but were 'badly-named' received no more than one or two offers, if any at all, while 'well-named' pets of the same species and color received multiple offers. And not only was there variation in the quantity of the offers, there seemed to be quite a difference in the supposed 'quality' of the offers as well. I found this all intriguing. Never before had I considered that a name held worth, much less that it could potentially be measure in terms of neopoints. As usual, this led me to my starting question. "Exactly how much more is a well-named pet 'worth' in comparison to a badly-named pet?" So what was it about those certain names that made them so much better? Why are the names with numbers considered bad? In an attempt to answer these background questions, I dragged my sardine-crazed owner out of the corner (where she'd been twitching and giggling maniacally) to create a board asking this. I was mildly surprised to find that no one could really give me a straight answer. "Because a good name is like a good color, it lets you showcase the pet." But why? Why is a name without numbers 'better' than a name with numbers? Couldn't just anyone put together a decent-sounding group of letters? So what makes them so special and unique? No one could really seem to supply me with an answer. The closest I came to a sound reason was posted just as I was about to leave. Interesting. Another human speaking of this so-called 'real life'. They all seem to firmly believe in it. How long will it take for them to realize that there is no more scientific evidence to support this claim than there is that Fyora has a twin sister (which could actually explain quite a few things)? Regardless, this seemed to be the most solid reasoning. No one else seemed able to explain the problem with certain names or why others are so desirable when anyone can make them for free at any time they want. Having completed as much of my background research that seemed possible, I began work on my hypothesis. "If I put a well-named pet and a badly-named pet of the same color and species up for trade, I will then find that the well-named pet is worth considerably more than the badly-named pet because well-named pets are more appealing and therefore in higher demand." My insane human, for reasons I cannot begin to fathom, has taken to the practice of adopting pets from the pound, using the lab ray on them, and then slowly releasing them back into the pound. The only problem is that if she decides she likes the pet, she'll be extremely reluctant to let it go. The result of this is that she now has two side-accounts completely filled with random labbed pets. Normally I would shake my head and ignore her inexplicable practices, but for the purposes of this experiment her packratting of pets would actually be extremely helpful. 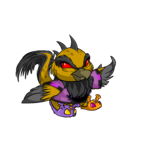 Even with only a quick search through the various possibilities, one pet stood out as the obvious choice: Sangyi, the Disco Kacheek. The problem was that I now had to procure another Disco Kacheek, but with an alleged 'bad name'. This proved to be remarkably difficult. 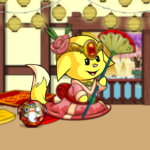 It seems that Disco Kacheeks are not especially common on the Pound Boards. And the few other Disco Kacheeks that I was able to find up for trade happened to be fairly well-named themselves. It wasn't until after several days of searching that I was fortunate enough to discover QooKougra100368. A 'badly-named' Disco Kacheek, she is fortunate enough to have Stacibelle as her owner, one of the rare humans who can ignore the naming issues and love the pet just they way she is. Stacibelle was also kind enough to allow me to borrow Qoo (as we will call her) in the interests of the experiment. 2. Bring both Sangyi and Qoo to the Help Board in order to have their names rated. 3. Make Sangyi the active pet. 4. Create a topic on the Pound Board titled "Disco Kacheek UFT". In the first post, be sure to state that it doesn't matter if the offered pets are well-named or badly-named, thus placing all emphasis of 'value' on the color of the pet and none on the name. 5. Record all offers made for Sangyi. 6. Find the 'values' of all offered pets by searching the cost of their colors in the Trading Post. 7. Average out all the offers, removing any outliers. 8. Repeat steps 3 - 7 with Qoo. 10. Repeat entire experiment at least three times to ensure validity. Asking for both names to be rated on the Help Board was entirely to prove which name these humans considered 'better' and exactly how much better they thought it was. Coaxing my human down from the top of the bookcase (thank goodness a Tin of Sardines only costs 10 NP), I had a board created. The humans were asked to rate both names on a scale of 1 - 5, 5 being the highest and 1 being the lowest. After 54 votes and the removal of one unexplained outlier (-329735289), Sangyi's average rating was 4.2 and Qoo's was 1.5. This clearly showed a substantial difference in 'quality' between the two names. Upon bringing Sangyi to the Pound Board, I was not only mildly surprised by how rapidly the offers came, but also their extreme variation. 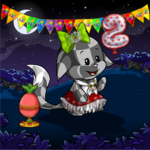 On the first attempt, offers spanned from a Cloud JubJub (Cloud Paint Brush = approximately 100,000 NP) to a Faerie Lupe (Faerie Paint Brush = approximately 3 million NP). Within an hour, I had received fifteen offers. Averaging these offers proved to be a bit more difficult than initially expected. I had to remove approximately half of the offers due to the fact that they were either lab-only colors (and therefore impossible to determine the price of) or were Limited Edition pets (whose species adds extra, and difficult to define, 'worth' to the pet). After repeating this experiment three more times on different days, I discovered the average 'offer value' to be exactly 1 million neopoints. All for a pet whose color would cost 460k to paint. According to that data, the name "Sangyi" adds 540k to the worth of her color alone. Quite a hefty sum for six letters. When I brought Qoo to the pound boards for the first time, what struck me was how long it took to get a single offer, whereas I had received an offer on Sangyi immediately after the first 'bump'. After 36 minutes, I still had no offers, although I received one "awe gl". I decided to give up for the time being; I clearly wasn't going to receive offers. Returning at 4:00 NST (one of the most active board times), I once again attempted to place Qoo UFT. Within the first half an hour, two people informed me that they would offer if it hadn't been for her name. After several attempts, I still had received very few offers for Qoo, but eventually, I had to recognize that this was simply as many as I was going to get. Averaging the ones that I did receive resulted in an average offer of pets 'worth' 460k. So what does this mean, one might begin to ask. To begin with, it shows that according to the world of trading, the name Sangyi is 'worth' 540k more than the name QooKougra100368. This isn't even factoring in all the extra time and effort it took to even get any offers at all for Qoo. It also shows that the name QooKougra100368 is so 'worthless' that it adds virtually no value at all to the color. And Qoo certainly isn't the only example of this situation. A quick look at the "Hard to Trade" boards showed that the problem pets are rarely the ones who have cheap colors. Strolling through one of them, I saw Rainbow Unis, Shadow Tonus, Clay Kikos, Pink Aishas, Mutant Hissis, Split Meercas, and countless more. Naturally, the common theme amongst all of these beautiful pets was their lack of a desirable name. But why is this? Why does a single name make so much of a difference? Why are these good names so much more advantageous? In an attempt to gain some insight into the possible answers, it was once again time to return to the Pound Boards. My owner, naturally, was initially nowhere to be seen. I was forced to waste half an hour or valuable time searching for her, eventually discovering that she had curled up beneath a Giant Green Kelp in the backyard. When I finally managed to have the thread created, the responses I received this time were remarkably thought-provoking. Quite a bit of the reasoning people gave was based around role playing, which I found interesting. It would seem that a majority of the humans on the trading board are only there to pick up role playing pets. Or perhaps it's simply the first reason to pop into their minds. And indeed, it is a decent reason, but surely it couldn't account for this huge separation in value between a good name and a bad name. I really can't imagine that role players alone have caused this. This, of course, is quite true indeed. Pets are very changeable, even when it comes to matters such as gender (which is rather odd, if you ask me. I couldn't imagine being turned into a male). However, there is simply no way in all of Neopia to change the name of a pet. There is no item you can buy, no amount of neocash, and no faerie quest that can ever do this. It seemed, at this point, that several pieces were beginning to fall into place. And there it is. The answer itself: personal preference. Now that I sat down to think it all out, it makes a lot of sense. Many, many humans have a 'personal preference' for pretty names. We all prefer examples of beauty, even crazed robot humans. And, of course, if they're going to be getting a new pet, they want the best pet they can possibly get. Added to the fact that names are unchangeable, the name becomes an important part of the trade for the person. So, of course, they reject any badly-named pets and want only well-named ones. This mindset rapidly would spread throughout the trading world until the desire for well-named pets became commonplace, and most will refuse anything else. This is supported by the fact that excellent names are not impossible to come by. Anyone can potentially create them and so they really aren't too difficult to find. Therefore, why should anyone have to deal with a badly-named pet? And so, through sheer demand due to the preference of a majority of traders, names have become quite the issue. So much of an issue that in one case, a well-named disco Kacheek was 'worth' 560k more than a badly-named one. Just as we have seen in Neopia's steadily growing economy, supply and demand can have shocking effects on even the most simple of things. My hypothesis proved to be entirely correct. In this instance, the well-named pet was worth more than double the value of the badly-named pet. Names are rapidly becoming a commodity. They are obtaining a value that can potentially be measured in terms of neopoints. As shown in the performed experiment, they can possibly give as much or more value to a pet than its color can. In terms of trading, a well-named pet has a truly remarkable advantage over one who is not. Descending the stairs down into my laboratory, experiment completed, I am reluctant to simply place this notebook on the shelf to collect dust. For some reason, I have found the results of this experiment a bit concerning. But despite my own logic, these humans are stunningly headstrong. Now that this practice has been set in motion, I simply can't imagine how it would be easily stopped. Tucking this report in beside the rest, I'm certain that this isn't the last I'll see of this issue. I can't help but wonder what this could mean not only for the future of trading, but for the future views of neopets ourselves. Wow. By no means was this a single-Neopian project. I owe many, many people a big huge "Thank you!" To start with, I would like to thank fuzzywuzzy_6, fillpy111, p0keth, and pirate_11 for allowing me to use their words, as well as everyone else whose opinions I ended up not needing. I would like to thank everyone who offered trades on Qoo or Sangyi these past few weeks, and I'm sorry that I couldn't accept any of them. I would love to give a very, very special thank you to the wonderful stacibelle for lending me her incredible pet, Qoo. And, of course, I need to give a quick shout out to caterade, Sangyi's absolutely amazing new owner. Thank you, everyone, I owe this all to you. We do share the giant omelette, right?